Efforts to fight desertification in the south central province of Binh Thuan have paid off as impoverished soil – a result of water scarcity – is gradually being replaced by greenery. Director of the provincial Department of Agriculture and Rural Development Mai Kieu said that due its geographic location, Binh Thuan has the driest climate in all of Vietnam, with an average annual rainfall of 1,000-1,600mm, only half the average rainfall in the southern region. As such, more than 80,000ha – or 11 percent – of local natural area is desert land. Desertification is even more severe in coastal districts. Strong winds and sand storms during the October-April dry season have caused land degradation along 50km of its coast. He said desertified areas are often considered ‘dead land’ as no trees are able to survive without human intervention. However, with efforts to revitalise such areas, Binh Thuan has taken various solutions to expand farmland for local residents, Kieu noted. Developing irrigation is the first step to realise this plan. More than 270 irrigation facilities, including some with the capacity of over 40 million cubic metres have been built, like Song Quao, Ca Giay, and Long Song reservoirs. 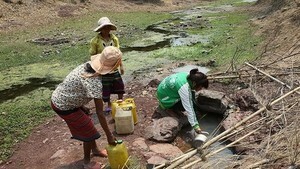 They are able to provide water for 70,000ha of land. These irrigation facilities have proved effective, speedily reviving dry areas in Tuy Phong, Bac Binh, and Ham Thuan Bac districts. Locals have also been digging ponds to develop aquaculture, generating a major source of freshwater aquatic products. Chairman of the provincial People’s Committee Nguyen Ngoc Hai said the successful expansion of irrigation systems has not only helped Binh Thuan supply water for farmlands, but also minimised water shortages, boosted crop restructuring, and increased farming areas. Local authorities have also been working to form coastal protection forests stretching over 8,000ha from Tuy Phong to Ham Tan districts. These forests mainly include phi lao (casuarina equisetifolia), neem trees (Azadirachta indica), and wattles (acacia) – all of which have been growing well in coastal areas with shifting and semi-shifting sand. Hai said these forests have initially proved useful for reducing winds, improving the local environment, and ensuring the stable growth of other crops. 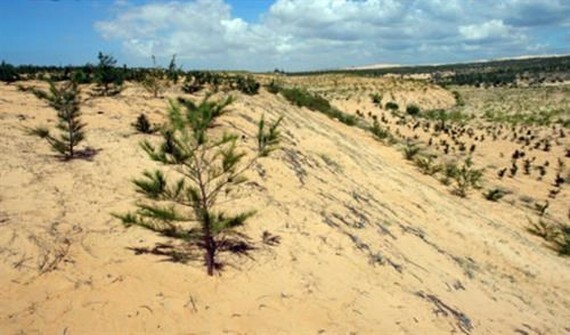 Many anti-desertification projects have also been carried out successfully on a trial basis, including those targeting rainwater on sand collection, anti-shifting sand afforestation, irrigation system development, sustainable agricultural production programmes, and the transfer of better cultivation measures. The initial successes of these projects have helped improve Binh Thuan’s capability in controlling natural degradation and turning thousands of hectares of ‘dead land’ into fertile area for production and tourism, according to local authorities.